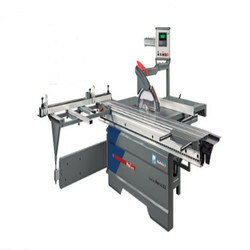 Manufacturer of a wide range of products which include panel saws pro 3.2, panel saws promatic 3.2, panel saw j-3200 in, panel saw machine with scoring prince gold and prince smart panel saw machine. Manual fine adjustment enables the ripfence to be adjusted precisely. The fence can be set with pinpoint precision by means of the adjusting screw. It is a powerhouse produced with the latest manufacturing technology. The saw shaft runs incredibly smoothly, because it is electronically balanced as a fully assembled unit, and extensive use of cast components in the making. The high precision vertical movement of the unit is linear with maintenance -free guide bearings & allows the whole unit to tilt easily & precisely to exactly the correct angle. Lifting and tilting of saw unit by means of hand wheels on the machine. Both wheels are placed on front side for more convenience. Along with user friendly control panel with Electronic Digital readout of saw unit tilt. Runs on large rollers sandwiched between hard chromed guide bars. Hollow multi-chamber alu. extrusion guarantees optimal torsion resistance & rigidity. The multi-chamber system builds superior torsion-resistance and maximizes the rigidity of the double roller carriage, assuring precision movement. The machine allows the ease of scoring adjustment from front side. Entire saw unit is on heavy duty cast-iron trunnion. Crosscut mitre fence is equipped with DRO that displays the job length digitally. This enables a setting precision accuracy of +/- 0.1 mm. It has an accuracy of +/- 0.1 mm. The high precision ball spindle system guarantees precise adjustment of the ripfence. All major control functions are always visible. The panel pivots into the most convenient position & is accessible from both sides of the machine. 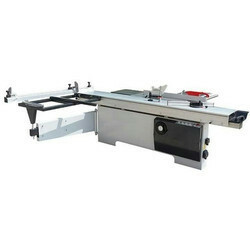 We provide Panel Saw J-3200.in to our clients. 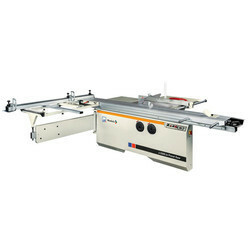 We offer Panel Saw Machine with Scoring Prince Goldto our clients. 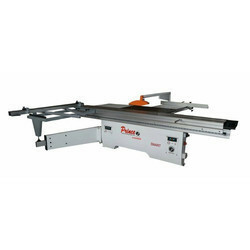 Prince smart Panel saw machine is very strong and user friendly. 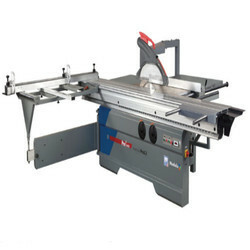 It is used to cut panels, plywood and also solid wood in right angle and straight cutting in exact dimensions. The special lenses on the main FENCE scale for stoppers to get the exact measurement. Micro adjustments is available on right hand side fence. It is very easy for operator. Electrical switches are provided on both sides for easy operation. The switches are user friendy. Push back support is available on the sliding carriage for convenient of operator. Hanging Guard on the saw blade is provided to collect the Saw dust. Operator don't need to remove the guard during operations.